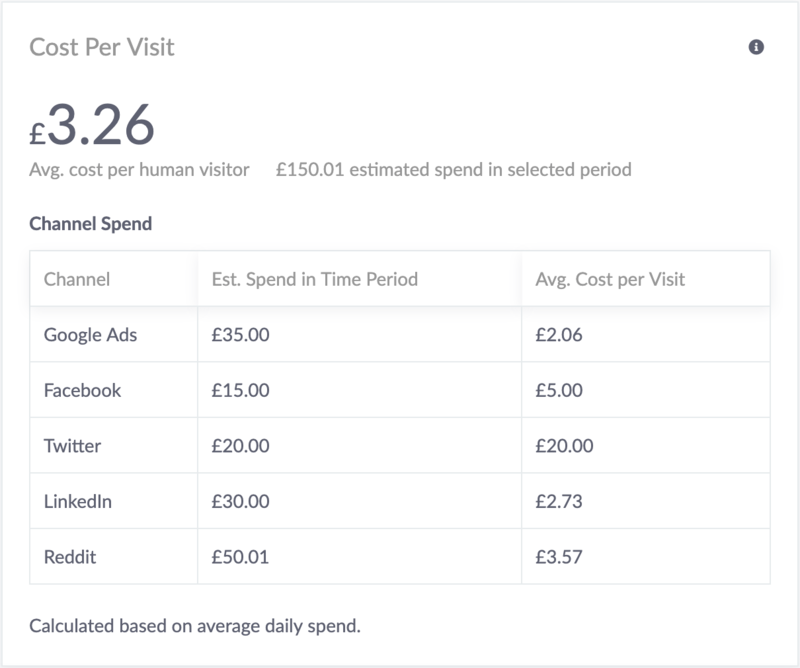 With Beacon’s Cost Per Visit calculator you can see an estimate of how much each link click is costing across your all PPC campaigns. CPV is a new way for marketers to analyse the effects of their online efforts and adds to the existing CPM (Cost per Mille/Thousand Impressions), CPC (Cost Per Click), and CPA (Cost Per Acquisition) when it comes to working out how effective your Pay Per Click advertising is working. It breaks down the advertising cost to a figure per legitimate visit and lets marketers see instantly how much each CPV is costing them. Because our mission is to reveal the true value of your digital marketing, Beacon tells you how much you’re spending on real human clicks – we do not include inflated, fraudulent, or bot click numbers in this calculation so you can see the true cost of sending real eyes to your website. Here’s how we work it out. Each channel is given a spend for that channel which may be a combination of actual spend on ads and people time. The spend in a campaign is the total of all spends in channels for that campaign. When working out the cost per visit for a time period, we calculate a “daily cost” for each channel, based upon the time period we’re looking at OR the lifecycle of the traffic in the channel. This is what we use determine the cost per visit. If we view the same campaign in a shorted time sensitive report, for example the last 7 days, the spend for that channel over the 7-days will be deemed to be £700 (£1000/10*7 – where 10 is the lifecycle of the traffic in the campaign). If 50 of the visitors came in during the past 7-days (with, logically, the other 50 visitors arriving in the first 3 days of the campaign), the cost per visit will be £14 (£70 / 50). If you have not started using Beacon yet, and would like to learn how effective your digital marketing budget really is, book your free demo now.